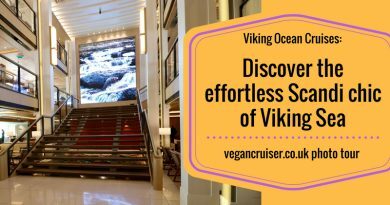 Our November 2015 cruise on the Adriatic (aboard Royal Caribbean’s Splendour of the Seas) was our first attempt of vegan cruising – for hubby that is. I wasn’t vegan at that point, but that shall be our starting point for this blog of mine. We had cruised the Mediterranean and Baltic before on various cruise lines but only from a vegetarian & omnivore perspective. Our week aboard Splendour was first of many newly vegan adventures and soon I will be onboard Vision of the Seas as a vegan myself – and I cannot wait! 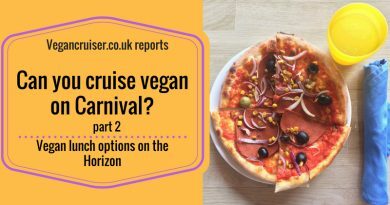 Our first vegan sailing went so smoothly that we have no problem with recommending cruising, or at least Royal Caribbean, to those hesitant vegans out there who may be thinking it would be an interesting way to holiday – but are worried about being stranded for 7-14 days with very little food. Although, you’re never ‘just’ onboard. Think of all of these wonderful destinations! But the lack of food, that surely can never be the case. Cruises are total food fests. Yes, almost all of it is aimed at omnivores but every menu I have come across has had several vegetarian options – occasionally ‘accidentally’ vegan too. Though often, unfortunately, laden with cheese, cream or made with egg, which makes them unsuitable for the vegan diet. Out of 7 days on Splendour In November, I think there were a handful of vegetarian options on the MDR menu that were actually vegan. But even then, we had a fabulously well-fed 7 days aboard Splendour. So much so that my hubby was sharing his food with me (when we dined the two of us) or with table-mates when we joined a larger group of diners. Out of 7 days on Splendour, I think there were a handful of vegetarian options on the MDR menu that were actually vegan. But even then, we had a fabulously well-fed 7 days onboard. So much so that my hubby was sharing his food with me (when we dined the two of us) or with table-mates when we joined a larger group of diners. Before we sailed out of Venice, I had contacted Royal Caribbean customer service to notify them of the ‘special diet’. Most cruise lines prefer having this 75-90 days before the sail-out date. So once we got onboard, the main dining room (MDR) was already aware of my hubby’s vegan diet. We went to speak to the dining room table reservation booth (as we were MyTime rather than Traditional set-dining guests) as soon as we boarded. Staff there assured us they had a note of the vegan request and advised us to talk to our waiter when we dined. And so, on our first night of MyTime dining (anytime between 6.30-9.30pm), we alerted our server to our dietary need. It resulted in the head waiter Viktor to come see us. First night was a lucky dip really, but from that night onwards we were presented the following day’s menu to see if there was something my hubby would like, that could be made vegan. The chef would also give suggestions or we were able to request meals. And every night there was plenty. So much, he could share. With hindsight, now that I am vegan too, I think I may pine for desserts. I cannot remember any vegan cakes or cookies having been on offer, just sorbet. 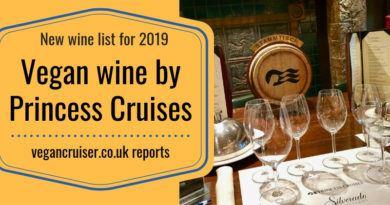 So yes, my next cruise holiday will be lighter on the calories no doubt but hopefully still well fed and full of exciting ports to visit.